The Phoenix Rising... Symbolizes the Rising of the Sudanese People! HOAs Phoenix Rising iBook to Fund Sudanese National Issues! The HOAs Phoenix Rising symbolizes the rising of the Sudanese people. لتقرأ باللغة العربية، انزلق نحو الأسفل، ولا تنسي ان تأخذ نسختك من الكتاب، وتعمل ريتنغ ٥ نجوم، وترسل موقع الكتاب لاصحابك وللتواصل الإجتماعي الذي تشترك به... شكراً جزيلاً من الأعماق. خذ نسختك من ‫-‬ iTunes. Yes, the HOAs "Rising of the Phoenix" symbolizes the rising of the Sudanese people. But, when? We time it perfectly. Just come to us. This is a project to support Sudanese national issues through the rising phoenix iBook. Please, be patient and skip this to read the Arabic below, if you wanted to. Well, in fact, the phoenix itself symbolizes the Sudanese people, as they are still burning in the bad political development in the country led by the worst military religious regime in the world... and yes, the most aggressive regime led by thieves wearing Islamic logos. Therefore, the Sudanese people have many uprising to get out of their aches... and here is where the Phoenix Rising symbolizes them in their noble uprising. In addition, the main issue is to support the Sudanese national struggle, using some new revolutionary methods to conquer the terrorist regime of Sudan led by the wanted by the ICC criminal Omar al-Bashir and his gangs. We shouldn't rest at all until we tumble this military religious regime, which is the ugliest and worst of all Sudanese dictatorial regimes. This heroic project is also one of many humanitarian and political projects in the HOA Political Scene, main composed from the HOAs Comprehensive Projects to include HOAs Journalists Project, HOAs Poets project, HOAs USHA Project, Sudanese Martyrs Tree Project and some humanitarian projects at the Humanitarian Network of the Horn Africas Network. We use also some other literary products to support Sudanese national causes. In addition to the main goal, you'll in fact enjoy the good writing of a Sudanese national pen with more than half a century of expertise. Here is one of the project: It's Love in the Internet Time. 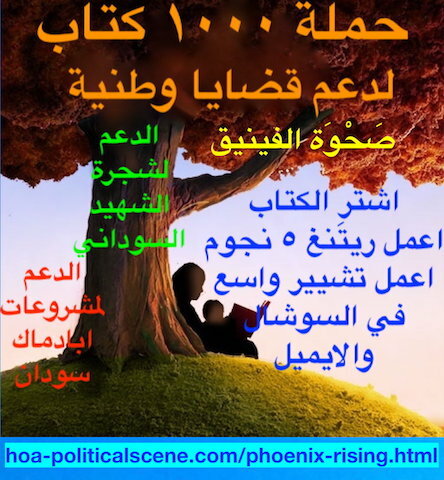 hoa-politicalscene.com/phoenix-rising.html - Supportive literary product: Love Internet Time by poet, writer and journalist Khalid Mohammed Osman. This would be absolutely good manner to treat our political problems by fundraising project s like this. In fact there are some good projects ar the HOA Political Scene and the HOA Political Scene Blog, the network of the Horn of Africa and East Africa. Enjoy the Phoenix Rising and Be a Fighter Too, Even If You Didn't Take a Gun! It isn't difficult at all to be a patriot fighter. Anyone, regards to his or her age or abilities can be a freedom fighter. You don't even need to take a gun. Take the iBooks from this project, distribute them to any platform you are enjoying and sharing, encourage your friends to get them and do the same as you did and rate them high in the stores. But, if you want the gun, then join the Sudanese Tigers through the USHA page. Indicate that you are a Sudanese Tiger and provide good information about yourself. When chosen, you'll be assigned a nick name. Confidentially, the system is secure. The phoenix would rise definitely when you do this. You are a phoenix too. You rise from the aches too, as the mythological bird does. There are no odds. You are the God of your destiny... the revolution. Nothing will be perfect more than this. Get the Rising Phoenix from Apple. لنوعية الشعر فيه... فلأول مرّة سوف تكتشف نوعية من الشعر حديثة للغاية وتشتمل علي قالب شعر سريالي غريب من نوعه في هذا الإبداع الشعري الحديث... يُضاف الي ذلك أنسيابية الصور الحسيّة، في قالب لغة جديدة، تحوِّل "قلة الأدب" الي أدب حميم، يسكنك حتي النشوة الذهنية... وحيث تتحرك الصور مع المقاطع، فيما يشبه شعرا مسرحياً، له القدرة علي ان يمشي بقدمين، وتهتزّ مؤخرته كأنثي يذوب الطريق من خطواتها الرشيقة. 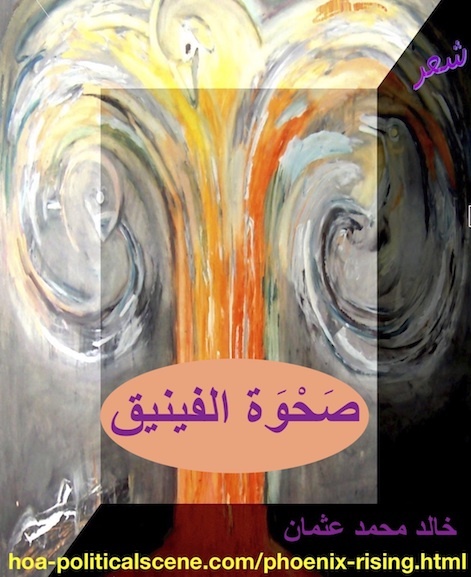 يشتمل الكتاب الإلكتروني أيضا علي مقطوعات الشعر السياسي، وشعر المنفي والذي ظلّ ولقرابة النصف قرن من الزمان ملجأ الشاعر الصحفي السوداني، وهو يعاني من هذا الإغتراب النفسي الطويل، بالإضافة الي معاناته من من الأحوال السياسية القاسية، التي يعيشها أهله وشعبه، في الوطن الحزين، بفعل ممارسات هذا النظام الديكتاتوري الشمولي، الذي يجثم علي صدر الشعب السوداني منذ عام ١٩٨٩م. وأجمل ما في كتاب الشعر "Phoenix Rising" أيضا، هو انه وبحصولك عليه فأنت تدعم مشروعات سودانية وطنية وإنسانية، في ظرف دقيق وحرج من تاريخ السودان. هذا الدعم موضّح في البوسترات الدعائية المرفقة مع حملة ١٠٠٠ كتاب لدعم مشروعات سودانية وطنية. "Phoenix Rising" للشاعر الصحفي السوداني خالد محمد عثمان علي ال iTunes و Apple's AppStore... يأتي الكتاب في هذه النسخة الإلكترونية لتحميله علي الايفون او التابلت او الماك او اي جهاز يستقبل منشورات ال iBooks. عند حصولك علي هذه النسخة فأنت تدعم مشروعات سودانية وطنية. في هذه السلسلة من الدعم نتحرك لدعم مشروعات انسانية ووطنية أخري في القرن الإفريقي. اذا حصلت علي نسختك من ال iTunes - App Store ارجو ان تستخدم هذا الفورم / استمارة التعليقات comments للتعليق، او لتحكي لنا عن تجربتك عند الحصول علي نسختك، او لتكتب عن أي صعوبات وجدتها هناك. شكراً جزيلاً.